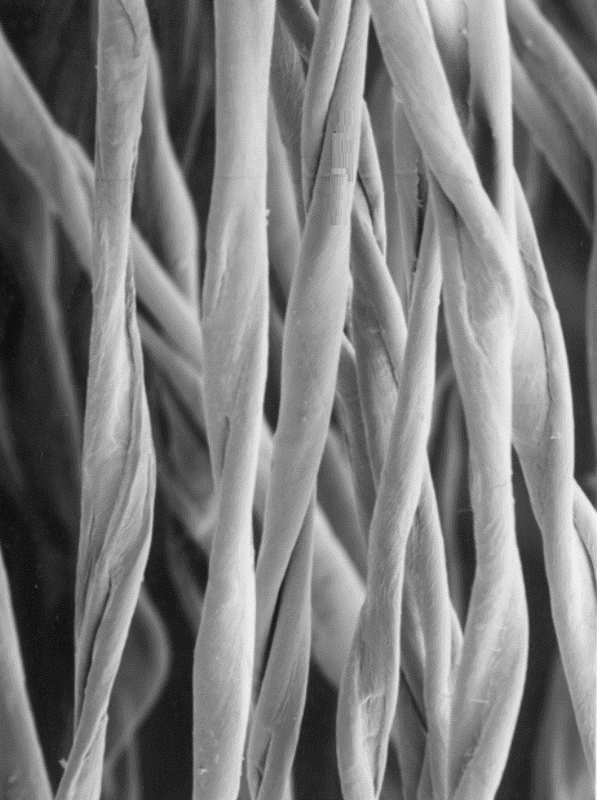 Following figure shows the morphological structure of cotton fibre. The cuticle of the cotton fibre is a very thin layer tightly attached to the outside of primary wall. More accurately, cotton fibre is enclosed in cuticle which protects the fibre from any mechanical and chemical damages. The cuticle consists of cotton wax, mixture of fats, waxes and oils. During initial stages of growth, the cuticle appears as an oily film. During the later stage, the cuticle becomes hard like a varnish. The primary wall is built up from cellulose. It also contains pectineus substances. The cellulose appears to concentrate from the growth period and increases proportionally later stage of cell elongation. On the surface, the molecular chains in the primary wall are arranged in a random manner without any orientation and definite order. However, cellulose present inside the primary wall is in the form of fine threads or fibrils, when observed through microscope. The fibrils are not parallel to the fibre axis but spiral at an angle of about 700 round the fibre axis. The spirals do not reverse in their direction; the spiral angle is greater at the tip and smaller at the base. The diameter of the cotton fibre is fairly constant throughout the length except at the base and the tip. The diameter of the fibre is in the order of 15-20 microns, whereas the primary wall is very thin and about 0.1-0.2 micron thick. It is composed mainly of cellulose and contributes most of the weight to the fibre, in general, within the primary wall, the bulk of the fibre consists of secondary wall. Like primary wall, it consists of concentric layers of fibrils in spiral formation. 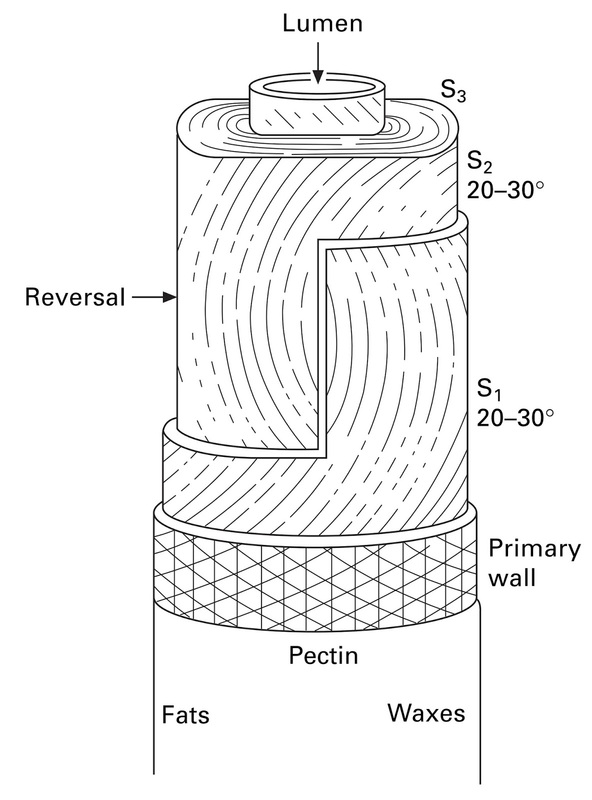 The outer layers of secondary wall, deposited near the primary wall are built up of fibrils at spiral angle of about 200-300 The fibrils in the subsequent layers are finer than former and the spiraling angle is about 200- 450 The spiral angle changes slightly in magnitude between the outside and the inside. The spirals also change their direction of rotation at frequent intervals along the fibre length at the reversal point, they simply form a curve. Always the second set of fibril begins in the opposite direction. In all the layers, the fibrils tend to follow a closely similar pattern. Arrangement of chain molecules in different parts is shown in fig. 1. At the centre of the growing fibre, there is a lumen, which remains as cylindrical void at maturity. The area is about 30-35% of the total area of cross section. The lumen content evaporates after the boll splits. After drying and collapsing of the fibre, the area of lumen is reduced to about 5% of the total area. Of course, there is variation from fibre to fibre. In the dried state, lumen contains colouring matters apart from other impurities, which decides the colour of the fibre. When the cotton fibre starts developing on cotton plant, initially it is like a hollow tube having only primary wall. As the time passes secondary wall depositions will go on taking place on inside pad of the primary wall and the hollow tube will start filling up. When the cotton fibre is fully developed, ideally the secondary wall occupies 85-90% of the cross section of the fibre leaving a small capillary at the centre called as Lumen. The secondary wall gives the strength and rigidity to the fibres. In a fully developed fibre called as mature fibre the secondary wall development is complete (85-90% of the cross section) and lumen size is small thus these fibres are having more strength and rigidity and therefore better mechanical properties. 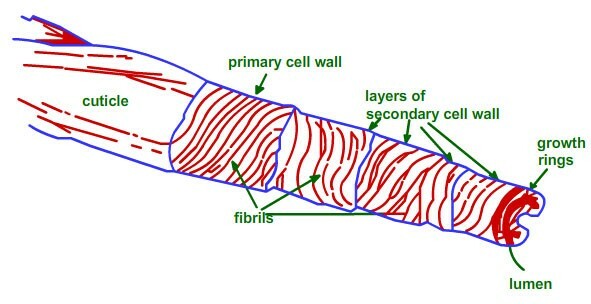 Many a times, due to certain reasons, the secondary wall development does not take place fully and then the fibres remain under developed or immature. Due less development oi the secondary wall in immature fibre the size of the lumen is bigger. The immature fibres therefore have lower strength and they are less rigid or more flexible. Due to this higher flexibility these fibres form more entanglements during processing which results in neps (entangled mass of fibres). Thus immature fibres will give yarns with lower strength and higher neps. Due to less secondary wall deposition the immature fibres will also pickup less dye during chemical processing.